Choctaw Nation backhoe driver Walter Belvins clears overgrowth around Lake Nanih Waiya. Charlie Hilton (left), and Walter Belvins keep debris clear from the shores of Lake Nanih Waiya. Maintenance of public sites is an ongoing effort by the Choctaw Nation. TVSHKA HOMMA, Oklahoma – Two full summers have passed since the Choctaw Nation entered into a Memorandum of Understanding with the State of Oklahoma about Lake Nanih Waiya. All signs point to a successful arrangement that has put the lake in good hands. The landscape surrounding the lake has seen buzzing with brush hogs and bobcats making the shorelines healthier and more accessible to visitors. Beneath the 131 surface acres of water, Lake Nanih Waiya is a well-stocked fishing hole welcoming anglers. “We stocked 14,993 1.5-inch Florida largemouth bass this past May; in April of 2017, we stocked 5,242 9-inch channel catfish,” said Don Groom, Southeast Region fisheries supervisor for the Oklahoma Department of Wildlife Conservation, this week. Groom works with the Choctaw Nation for oversight of Lake Nanih Waiya. It is one of 16 fishing lakes owned by the Wildlife Conservation Department. According to the MOU, the Choctaw Nation has responsibility for the application of herbicide on jetties to control vegetation, general road maintenance, trash removal and mowing. 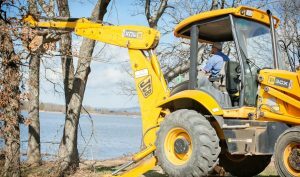 The Pushmataha County lake has been under the wing of the Oklahoma Department of Wildlife Conservation since its construction in 1958. The agreement went into effect Jan. 1, 2017 and runs through Dec. 31, 2019, at which time it could be renewed for a longer period. The State “still has full jurisdiction over the lake,” Groom said. In the meantime, a cooperative relationship has developed between the Wildlife Conservation Department and the Choctaw Nation. As the first summer drew to a close, improvements had been made with still much teamwork to go. The first year saw many maintenance issues undertaken, from clearing overgrowth along Lake Nanih Waiya’s three miles of shoreline to donning scuba gear and assessing underwater issues. While the Nation focuses on beautification, safety, public access to the lake, mowing and litter control – several new trash cans have been installed and trash pick-up is now a routine duty – the state’s focus has been on dam and spillway maintenance, including adding a new fence and gate to keep vehicles from being driven on the dam. The state department also manages wildlife efforts in and around the lake. The Choctaw Nation consulted with the Wildlife Conservation Department on what herbicide to use, timing and the needed locations. Tribal crews then treated the jetties and other bank areas, while the state treated areas more easily reached by boat. Smaller areas of vegetation are treated intermittingly around the lake, so as not to adversely affect the waters. Items on the table include prescribed burns (the Choctaw Nation has already conducted a prescribed burn in the southwestern part of the public fishing area), improving camping opportunities, and improving bank access to the lake. The drawdown of the lake actually serves two purposes, to allow maintenance to the gate and for vegetation control. Visitors to the area may have already noticed the lower lake level. However, this is expected to last only for a short while. “The recent rains brought the lake back up quickly,” Groom said. “We currently need to lower the lake by 27 inches to keep water from entering the top of the intake tower.” A “trash rack” is being constructed to be installed on the top of the tower to help with future water control needs. Jack Austin Sr., Choctaw Nation District 7 Councilman, is someone who has observed the lake first hand long enough for three generations of his family to have fished there. Lake Nanih Waiya lies less than a mile from the site of the Choctaw Nation Labor Day Festival. 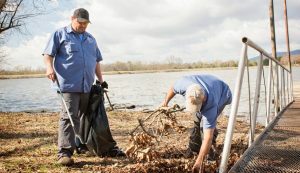 As the annual festival approaches, Choctaw Nation maintenance crews are busy prepping the lake for first-time and returning visitors to enjoy its recreational features. Traditional Choctaw dance demonstrations will be held in the Choctaw Village and on Choctaw Nation Capitol Grounds at the 2018 Choctaw Nation Labor Day Weekend Festival. 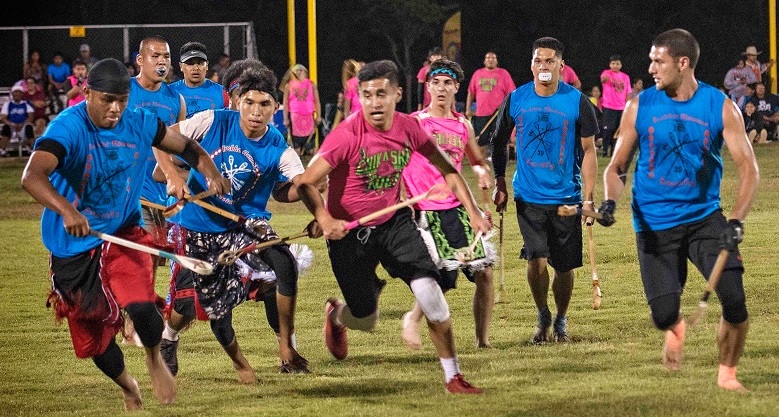 The ancient game of stickball is one of several sports tournaments that will run throughout the weekend at the 2018 Choctaw Nation Labor Day Weekend Festival. TVSHKA HOMMA, Okla. – What many believe to be the biggest tourism event in southeastern Oklahoma is only days away. 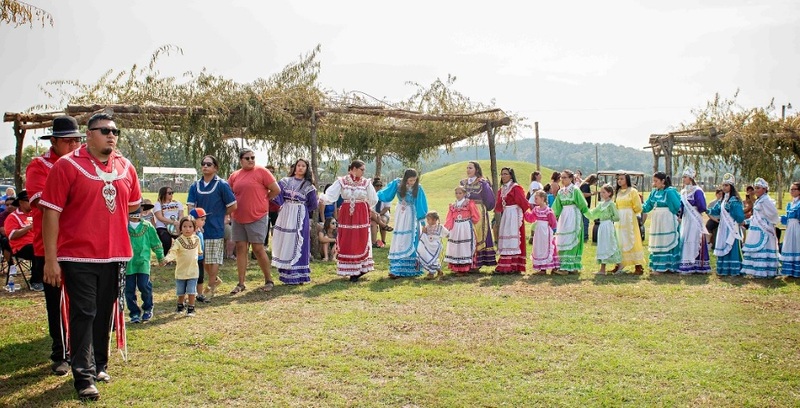 The Choctaw Nation Labor Day Weekend Festival draws tens of thousands of people annually to the Tvshka Homma area. With concerts, a carnival, sports tournaments, and quilt displays it resembles a state fair. It is all that and much more, including the much anticipated State of the Nation Address by Chief Gary Batton. The five-day event runs Thursday, Aug. 31 through Monday, Sept. 3 on the grounds of the historic Choctaw Nation Capitol, near the town of Tuskahoma, northeast of Lake Nanih Waiya in Pushmataha County. Families and longtime friends camp for the long weekend making for a number of reunions. Sitting in the shade, talking, laughing and enjoying each other’s company is among the most common activities. On-site spots for recreational vehicles’ water and electrical hook-ups must be reserved in January. There are, however, areas providing tent shade for primitive campers. Each year Choctaw Nation staff assist with everything from directing traffic and driving shuttles to running concessions and cleaning up. Hundreds are behind the scenes ensuring everyone has a memorable visit to the Choctaw Country. The festival is launched on Thursday evening with the Miss Choctaw Nation Pageant. This year a total of 23 contestants from all 12 districts of the Choctaw Nation have entries in one or more divisions: Choctaw Nation 2018-19 Senior Miss, Junior Miss, and Little Miss. Participants take the stage at 6 p.m. in the amphitheater. The evening concerts with contemporary headliners are always a big draw. This year’s country music lineup includes, on Friday, Sept. 1, Trace Adkins, Neal McCoy, and Jerry Tims. Saturday’s show will be Kip Moore, Dan + Shay and Kylie Morgan. Sunday is dedicated to Christian music. Gospel singing begins at noon and runs through the afternoon. Contemporary Christian music performers follow, including Chris Tomlin, Jason Crabb, Kingsmen Quartet and the Williamson. The Friday and Saturday evening concerts begin at 6:00 pm on Sunday’s at 5:30 pm. A traditional Choctaw singing will also be held at the Bertram Bobb Chapel, beginning at 7:00 pm Sunday. The festival provides an opportunity to view and even participate in Choctaw culture, both historic and modern. The Choctaw Village, with its housing, arbors or protective fencing is a step back in time and will be filled with craftspeople creating and demonstrating cooking, basket weaving, beading, and other traditions such as singing, dancing, and storytelling. The annual Choctaw Nation Juried Art Show, which will be on display in the Capitol Museum, gives a glimpse into living Choctaw artists from across the region. Painting, pottery, weaving and other categories bring great variety to the show each year. One of the air-conditioned facilities is the Arts & Crafts building which will house dozens of booths selling original art, jewelry, crafts, toys, housewares, clothing, and books. The Labor Day double-elimination stickball tournament draws teams from across southeastern Oklahoma and Mississippi. Team Tvshka Homma takes the field at 6 p.m. Friday, meeting Koni Hata for the first game of the tournament. Other tournaments and contests are slated – softball, basketball, archery, and volleyball, as well as Chief Batton’s Youth Fitness Challenge, horseshoe toss, dominoes, checkers, 3-on-3 War Hoops, a 5K run, and the always popular Tough, Tough Choctaw. Sports tournaments run throughout the weekend on the myriad of fields located on the capitol grounds. Chief Batton’s presentation gets underway at 10:00 am Monday, Sept. 3. Always a major draw, the 1,500-seat amphitheater fills up early. Choctaw gospel singers and traditional storyteller Tim Tingle will entertain the crowd starting at 9:30 am. The carnival runs daily to midnight and concessions offer a variety of midway foods and drinks. The air-conditioned cafeteria will offer hot meals from morning into the evening. The Choctaw Nation Labor Day Weekend Festival is open to the public. Admission to all activities is free. Parking is free. ATMs will be on hand if withdrawals are needed for dining, souvenirs or art purchases. The August 2018 edition of Biskinik offers a full schedule of events and a map of the festival grounds. To keep up with daily additions and alerts, as well as to review sports brackets and tournament details, refer to the website www.choctawnation.com online and the regularly updated Choctaw Nation social media sites on Facebook, Twitter, Snapchat, and Instagram.